North Bay extends from Dumfoundling Bay south to the Rickenbacker Causeway. A number of modifications have taken place in this part of the bay, most of which occurred by 1926. Two new inlets through south and north Miami Beach altered circulation in northern Biscayne Bay. The mangrove margins north of Coconut Grove and Key Biscayne were largely covered by fill, and bulkheads were constructed in order to develop the shoreline. Dredging of the bay margin for this fill left 10 to 20 foot deep troughs in much of northern Biscayne Bay. New dredged islands, port facilities, and six cross-bay causeways further segmented northern Biscayne Bay, with dredge-deepening of the bottom associated with each project. Accordingly, northern Biscayne Bay is now segmented into six compartments connected by narrow gaps in the causeways. In addition, sewage effluent emptied unchecked into Biscayne Bay until diverted to sewage treatment plants in 1969. These modifications resulted in high levels of turbidity in much of north and north-central Biscayne Bay, further restricting the distribution of important benthic habitats. Because of these changes, approximately 40 percent of north Biscayne Bay is too deep or too turbid for the benthic communities that characterized the natural bay, and the productive estuarine ecosystem has been diminished. Despite this, some parts of the northern bay remain highly productive. For example, there are significant mangrove wetlands along the Oleta River corridor, and the second largest mangrove stand is found at the Oleta River State Mangrove Preserve. In recent years water quality has been improved through regulatory action and shoreline revetment and restoration projects. The DERM (Miami-Dade County Department of Environmental Resources Management) has documented significant return of benthic communities in some portions of northern Biscayne Bay as a result of improved water quality. Central Biscayne Bay extends from the Rickenbacker Causeway south to Black Point and is bordered mainly by Coral Gables and Coconut Grove on the west and Key Biscayne on the east. This portion of the bay is the most well-mixed, achieving direct ocean exchange through the “Safety Valve” between Cape Florida and Soldier Key. Much of this part of the bay is also included as part of Biscayne National Park. South Biscayne Bay is usually subdivided into two parts. 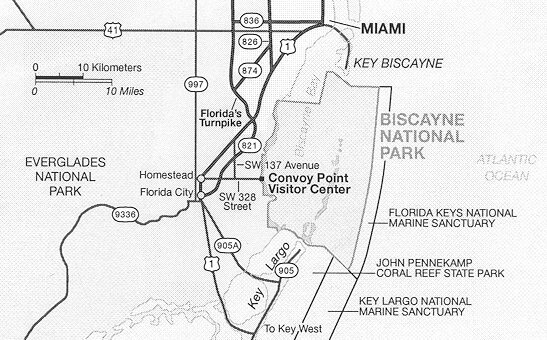 The south bay section extends from Black Point to Mangrove Point and encompasses the lower portion of Biscayne National Park. It is bordered by an intact mangrove shoreline that forms a narrow band along much of its coast. The extreme south bay stretches from Mangrove Point to Jewfish Creek and includes Card Sound and Barnes Sound. These areas are somewhat separated from the rest of the bay by extensive shallow banks and are isolated from their natural watershed by roads and canals. This section of the bay is part of the Biscayne Bay Aquatic Preserve and Florida Keys National Marine Sanctuary. In addition, parts of north Key Largo are also within the Crocodile Lakes National Wildlife Refuge. It is interesting to note that this area contains one third of all nesting of the American crocodile in the continental United States. Much of the southern bay, despite substantial development in the watershed, has retained its relatively pristine habitats and good water quality and supports significant production of economically important fish and shellfish. Changes in freshwater input, however, have altered its estuarine character. In addition, vessel traffic, along with canals, rivers, and other factors, has contributed to turbidity levels and is causing increasing damage to the benthic communities. The Biscayne Bay watershed is contiguous to the Florida Everglades and receives water from the Everglades that flows directly into the bay. The Everglades were originally an uninterrupted stretch of marsh that extended from Lake Okeechobee to Florida Bay, with waters of the Everglades connected to Florida Bay by transverse glades. Drainage projects, beginning in the first half of the twentieth century, converted approximately 65 percent of the Everglades to agricultural and urban uses. A great deal of that conversion has taken place in the Biscayne Bay watershed. Agricultural practices and the urbanization of the area have led to activities such as regional drainage, mosquito ditching, rock mining, landfills, and the construction of highways and roads. These activities and others have contributed to alteration of lands in the watershed. The fact that population of this urban watershed is expected to increase by over one million people in the next 20 years will only exacerbate the magnitude of impacts to the watershed and the resulting threat to the vitality of the bay. Remaining coastal wetlands adjacent to Biscayne Bay in south Miami-Dade County extend from Matheson Hammock County Park south to U.S. Highway One (U.S. 1), which divides Barnes Sound and Florida Bay. This area includes the largest tract of undeveloped wetlands remaining in south Florida east of the Everglades. In fact, most are in public ownership or slated for acquisition by Miami-Dade County or the South Florida Water Management District. Copyright © DiscoverBiscayneBay.org. All rights reserved.